Stripe Connect enables you to control creadit cart payment on behalf of merchant’s connected accounts. By configuring Stripe Connect API you can perform the common task of processing payments on a seller’s behalf. You’ll need CLIENT ID, SECRET KEY and PUBLISHABLE KEY from Stripe. INFO The same APIs can be used for vendor subscription billing. HELP! Learn more about Stripe connect. Read the Stripe documentation. Head to your Stripe account dashboard and go to the Connect section. Click Get Started button to activate connect account. After that, you’ll see the new Settings option on the sidebar. Go to Settings from the sidebar and click CONNECT under the Stripe apps section. On the next screen Integration section get the client ID, we’ll need this ID later on this guide. Now click Add URI button and give https://your_domain/admin/setting/stripe/redirect in the Redirect URI field. On the same screen scroll to Branding section and fill the form with your brand information, upload logo, and icon. 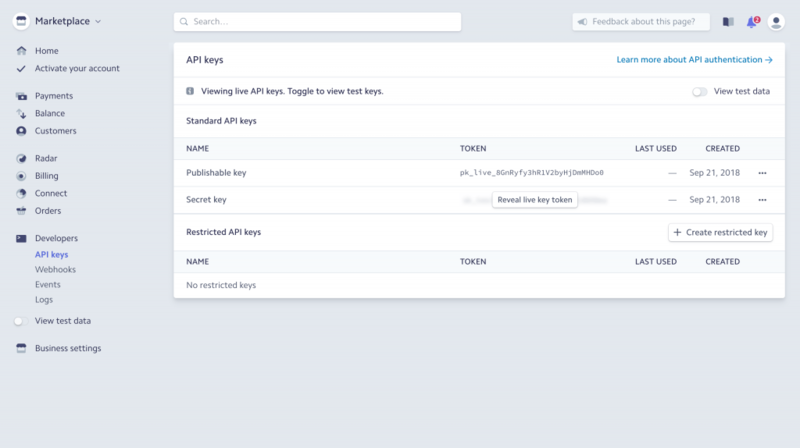 Next, go to Developers > API keys section from the sidebar and get the Publishable key and Secret key. Now you have done Stripe part and time to configure the platform, open the .env file and update these keys with your values. Note! Enable View test data to get test credentials on the Stripe dashboard. Warning! The stripe platform account and the connected account (seller) can’t be the same account. To test stripe connect use different accounts. Now from your platform’s admin Dashboard navigate to settings configuration payment methid tab and enable Stripe payment method so that your marketplace vendors can accept credit card payment.